Montana has no shortage of rivers. And where there are rivers, there are maps. And happily for anglers visiting Montana on a fishing or recreational floating trip, there are many river maps available to provide in-depth information about many of the popular rivers. Currently, three different types of river maps are available that show in detail all, or parts, of specific rivers in Montana. Since these river maps have been designed for both anglers and recreational floaters, the maps show the locations of fishing access sites, other access points, rapids, camping areas, and much more. What differentiates the maps is how they present that information, additional information they show (such as GPS coordinates), the paper quality used and the overall look/feel of the map. In short, there's no "one right map." Get the map that seems like it should work best for your needs. In terms of cost, maps vary in cost from $6 to $15 per map, depending on map type and where the map is purchased. Information shown on each map includes: islands, tributaries, fishing access points, water hazards, campgrounds, river miles and more. The Montana Afloat river maps are also extremely durable, being printed on the type of paper that doesn’t fall apart when it gets wet. They are also very easy to fold. Some of the larger rivers, such as the Yellowstone, have two distinct maps (the Upper and Mid maps). Montana Afloat Maps are available for virtually all of the popular rivers in Montana, and provide coverage for some rivers that the two other map types available lack (such as the Middle Fork and North Fork Flathead River). One of the problems with Montana Afloat Maps is that they are not widely available. Most fly shops in Montana do carry some of these maps. However, few fly shops carry all of them or have them in stock at all times. Still, if you happen to be in Montana and have a use for these maps, do hunt around for them in the local fly shops. With some luck, perhaps the fly shop will have the exact map you need. The more guaranteed way to make sure you have the map you need is to order it online. Oddly, the most logical place many would think would carry these maps – Amazon – doesn’t stock them. Nor do some of the popular outdoor fishing related retailers, such as Cabela’s or Orvis. The maps also show public land information, which is extremely helpful. These maps, which are available through Amazon, cost around $10. Some stores in Montana, particularly sporting good stores, also sell them - although they rarely have the "complete assortment" like Amazon does. 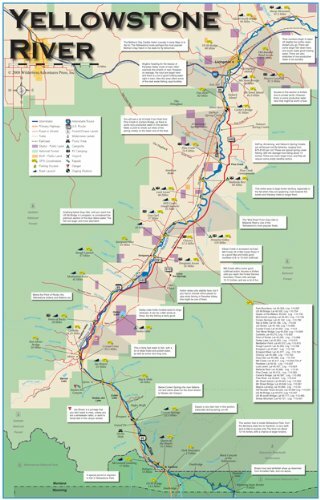 Maps are available for many of the more popular floating and fishing rivers in Montana, although their maps do seem to focus more on the rivers of Southwest Montana (Rock Creek, Bitterroot River, etc...). Availability of these maps seem rather limited. The only place I've found them is on the Amazon website, although some fly shops or sporting good stores in Montana are bound stock at least a few of them.